The Affordable Care Act (ACA) mandated that many chain restaurants and other “similar” food establishments list the calorie count of the food they sell. The requirement will take effect nationwide in December 2016, more than six and a half years after the ACA became law. On July 9, 2015 the FDA yielded to industry pressure, announcing that it would push back the rule’s effective date by one year, from December 1, 2015 to December 1, 2016. – A little more than one in three adults are obese, and an additional one in three are overweight. 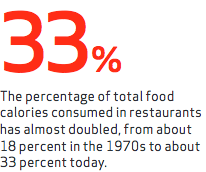 – The percentage of total food calories consumed in restaurants has almost doubled, from about 18 percent in the 1970s to about 33 percent today. – A small reduction in calorie intake can go a long way. A March 2015 study in the same journal concluded that among all consumers, there is a decrease of ten to twenty calories per meal. The FDA estimates that despite the cost of adding nutritional information to the menus, the new requirement will produce a “stream of benefits” of anywhere from $3.7 billion to $10.4 billion over the next twenty years. However, there are several other concerns with the new rule. – Some believe that calorie labeling had wide industry support because it was preferable to more onerous but far more effective obesity-reduction policies — in particular — taxing the sugar content of food. – The supermarket industry had said it might have to spend up to a billion dollars to implement the new labeling requirements. – A meta-analysis in the May 2015 issue of the American Journal of Public Health found no significant impact in the relationship between calorie labeling and what consumers actually order.